It is great to see the 2016 Census data released – and I know this is only top level figures. However, it reminded me of the quest for information by genealogists around Ireland and the World to trace our family lines. I am baffled why the Central Statistics Ireland (CSO) will not allow the release of the 1926 Census information. I am writing to you as I understand from the 1993 Statistics Act the CSO comes under your remit (or can be delegated). The law to bring in the 100-year rule to lock records was introduced as part of the Statistics Act 1993 and even then a commitment was given to the Seanad to reduce the lock to 70 years. Every attempt to change the law since has been blocked. You made a commitment to release the records in your 2011 Programme for Government and yet, each attempt to change the law to allow for the release of records was blocked. The 1926 Census would be a powerful genealogical tourism tool. For us family historians it would be wonderful to track each part of our family line between the 1911 census and 1926 census during this period of Irish history. Using myself as a case study in point. You know me as Jillian van Turnhout, my family name is Hassett.My Dad , Michael Hassett was the fifth of six children. 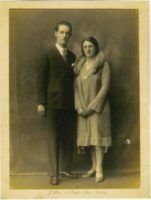 His parents (photo to the right) married in Dublin in 1930. My Dad, Michael was born in 1936 in Dingle, Co. Kerry. His mother, Mary Catherine Foley was born in 1905 in Cromane, Co. Kerry and she died in Ballintemple, Cork, in their then family home, in December 1944. His father, John Francis Hassett born in 1904 in Glin, Co. Limerick grew up in Knockanean, near Ennis, Co. Clare. John Francis died in February 1945 after an accident on his bike. My Dad was only 8 years of age when he lost both his parents within 3 months. On a side note, my Dad recounts when his father John Francis had the bicycle accident and ended up in hospital. My Dad always says he remembers being the happiest he had been in his life the day his father was due out of hospital. He knows this was a strange thing to say as he had only lost his mother less than 3 months beforehand but they had got such a fright after their Dad’s accident they were ecstatic as children to hear he was coming out of hospital. I can’t imagine what it was like for them to hear the devastating news that their Dad died on the morning he was due home. Only in recent years I got a copy of the inquest report from 1945 and was able to tell my Dad that his father died of a brain injury most likely caused by an undetected hairline fracture. Dad was fortunate that his Aunty Helen moved to their then home in Beaumont, Ballin temple, Cork to look after him and his five siblings (photo from about 1947) including his older brothers Tom, and Sean and baby brother Liam who would still like to know more about their parents’ history. My Dad, as you know, died last November and I am still on the trail of his parents and their ancestors through available records and newspaper cuttings. I know the 1926 census would provide such rich data and add to our knowledge and yet these records are ‘sealed’ until January 2027. I can access the 1940 US Census, the 1939 Register of England and Wales, the 1920 Canadian Census but alas not the 1926 Census of Ireland. The 1950 US Census will be released in 2022 – 5 years before Ireland releases the 1926 Census. And before you ask, the information in the 1926 Census comprises of forename, surname, age, marital status, relationship to head of household, religion, occupation and townland where born, employer, if unemployed normal profession – and so I wonder why the need for secrecy. Why can’t the 1926 Census be released? My Dads three brothers are currently aged between 73 and 81 years. The 1926 could potentially fill in important gaps of where was their mother and father in the years before they married in 1930. It is absurd that we have to wait until 2027 to access this information? The story of my family history is just one of countless who hunger for information on their identity and roots not to mention the benefits to tourism a release of this nature will attract. I call on you to bring in amending legislation to allow for access to this vital genealogical tool, the 1926 Census of Ireland. I am, of course, at your service if I can be of any assistance in furthering this cause.